The village of Curca can be approached from the Bambolim hillock or from Batim. 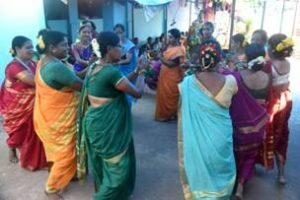 The former approach provides an aerial view of the village and lays bare before the onlooker what the village has on offer – salt pans, a meandering rivulet, fields and temples. However, the ancient church crowning the hilltop situated roughly in the middle of the village is a spectacle to behold while one approaches from the other road. The white of the church contrasts with the dark green shades of the hill drawing instant attention. At the end of the Batim road, one has to cross a new bridge spanning a rivulet. The ancient arches of a stone bridge come in view. Walking to the old bridge, one can see a marble plaque that announces the date when the bridge was commissioned. 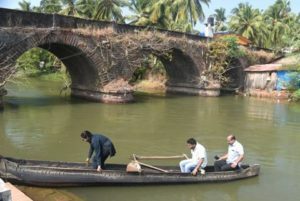 Crossing the bridge, one can access a tiny wharf where a boatman waits with his dainty dugout – a locally made canoe, scooped out from the log of a mango tree. Stepping into the boat is tricky – it wobbles on the water at the slightest sign of imbalance but the boatman counters your weight and extends a reassuring hand. Once settled down in the boat, all the fears vanish and the ▲ Going on a Ride on an old Fishing Canoe thrill of an adventure takes over. The boatman uses a combination of rowing and poling to get the boat going. If the tide is with him, his task is easy; otherwise, well it is an uphill task. As the canoe floats under the bridge, one can’t help but admire the perfect workmanship and precise engineering with hardly any mortar. Prior to the construction of the bridge, a group of ▲ Fisherman with his Crab-Trap boat-men rowed passengers across with the help ▼ Ari Erected Midstream Aids Fishing of these same canoes, giving the place the name ‘Tarikodem’ meaning ‘near the river crossing’. 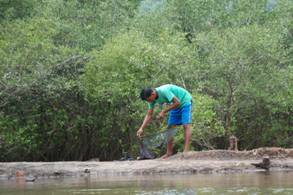 While the cool breeze caresses the hair, one might come across other fishermen either carry traps for the tasty river crabs, or casting the pageur (a circular net) from their canoe. 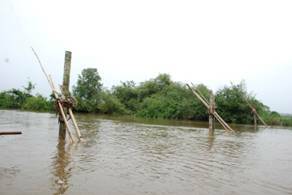 One also comes across some tall poles erected midstream – nets secured to these poles locally known as the ari provide a regular catch. After about forty-five minutes of pleasure cruising and learning about local fishing from the boatman, he docks at another wharf. A short distance brings one to the Bumika temple. One can visit the temple and toll the bell and wake up the devi or accept Prasad from the bhatji if he is at the temple. 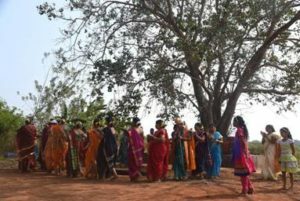 A tall papal tree with a ped around it is the next destination for that is where the local women will showcase their culture. Seated on the ped under the shade of the tree Local Dances in Progress one gets to see dances like the dalo and fugdi. 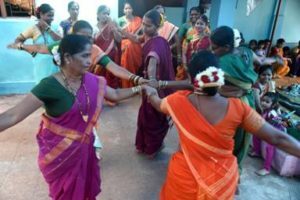 These women also churn out delicious home-made sweets like ladoos, chuda, puran poli and sheera which can be tasted while the dance is going on and downed with a glass of hot lemongrass black tea or cosai, a local herbal brew. 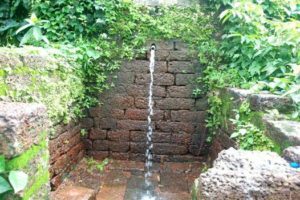 A spring located in the village provides a refreshing experience. A short walk up a hillside and one there in an enclosure a clear stream of spring water gushes forth, channelized through a pipe for the benefit of those who want to refresh. Wash away the sweat and dust and get ready for a delicious home cooked vegetarian meal. About 3.00 in the afternoon, the local bakery is busy baking its evening bread. 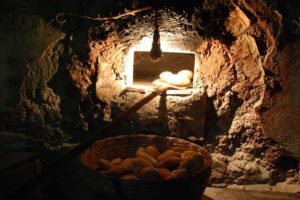 The bakery is very old and is fired by using firewood. Local bread, poi (brown bread) kankon (bangle shaped crisp bread), and boll (sweat bread) are baked daily and sold like hot cakes. The konkon is still a favourite evening tea time snack and is best had dipped in hot tea. The boll too makes a mouth-watering snack if buttered and consumed straight from the oven. Both the butter and the boll melt into your mouth! 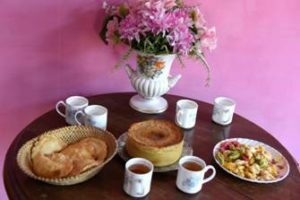 A short walk from the bakery, is located the house of Jose Rodrigues. It is a typical Goan house with beautiful old cement flooring and matching balustrade in the veranda. Jose and his wife prepare all the traditional Goan catholic sweets like dodol, bebinca, dos, bolinhas, neuros and a whole lot more. He is overwhelmed with orders during the Christmas season as his ▲ Evening Tea with Local Snacks reputation spreds far and wide. Seated in his veranda, tea and his snacks can be truly enjoyed in the traditional Goan way! 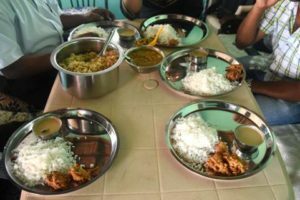 He also prepares and packs the choicest Goan masalas and these can be picked up from him at very reasonable rates. 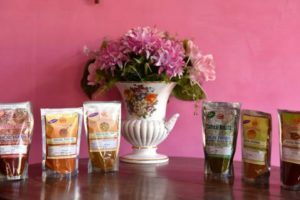 Since they are properly packed and sealed, these packets regularly find their way around the ▲Goan Masalas Made at Curca world. 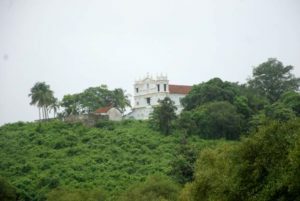 The visit to the village cannot be completed without visiting the hill on which is situated the Church of Our Lady of Rosary. The view from the tiny plateau on which the church stands is truly awesome! 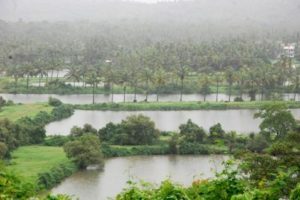 The panorama sweeps from the distant Siridao Bridge on one side to the fields of Velha Goa on the other. Salt pans, fields and fishing ponds complete the picture. The church was built in the 17th century in the Mannerist Neo-Roman style having three storeys and five bays. Its twin towers are crowned with spear type finals. The interiors of the church are majestic with a groin arched ceiling. Pencil sketches of the Stations of the Cross adorn the walls.